I've made pumpkin muffins before... usually I get the craving sometime in the fall when everything pumpkin is around! You can see my posts for pumpkin muffins with a cinnamon and sugar toping and pumpkin cream cheese muffins with pecan streusel!!! They are both insanely delicious! 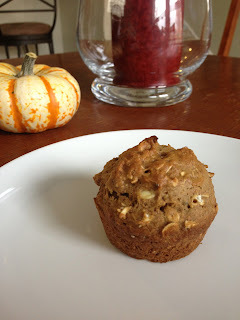 This fall, I was craving a pumpkin muffin that was more healthy. This may or may not have been prompted by my nutrition classes giving me a daily dose of nutrition and health! Regardless, I went with my craving in search of a healthier pumpkin muffin. And I found a good one!! These muffins are super dense, thick and chewy, just like I like them! I also used whole wheat flour and oats for added fiber, and pumpkin and chia seeds for added protein! I like the extra crunch and texture in these muffins! Since they are loaded with fiber, they have some strong staying power, which is great for those days when I don't get home for lunch! If you need to get in a healthy version of something with Halloween and Thanksgiving coming up, give these muffins a try! You won't feel guilty for eating a little extra batter while you're preparing them!! Optional mix-ins: nuts, chocolate chips, raisins. I added in pumpkin seeds and chia seeds. 1. Preheat oven to 400 degrees and line muffin pan with muffin cups, or spray with cooking spray. 2. Combine whole wheat flour through sugar in a large bowl and mix to evenly distribute ingredients. 7. Cool and enjoy. You can top with cinnamon, butter, or pumpkin butter! I prefer them plain because they are delicious on their own!